Berlin, July 8th 2016. Global Change Management students Luzmila Rosales and Maria Fiedler win the third prize in the 2016 contest of the GIZ initiative 'Between Lecture Hall and Project Work'. 44 international students from 5 different German Universities analysed GIZ projects by combining these practical insights with their academic knowledge gained during their studies. The top ten finalists were invited to the final symposium in the GIZ Representation in Berlin. Luzmila Rosales and Maria Fiedler presented their evaluation of a GIZ project in Peru and called their presentation “Looking at a bigger picture: introducing a systemic approach”. For the analysis of the project, the students used the MARISCO methodology which they got to know during their GCM-studies. The GIZ initiative is embedded into the module “Global Change and Development” offered by Christoph Nowicki and Prof. Dr. Pierre Ibisch since 2006. 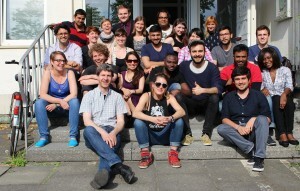 The second semester students of GCM participated in a block module of Germanwatch on Applied Climate Policy and took part as observers in the Bonn Climate Change Conference in May 2016. Both together provided the students with up-to-date insights about current and upcoming policy issues related to climate and sustainable development and an opportunity to link with key stakeholders who are active in the UNFCCC negotiation process. Steve Waddell (Networking Action) and Petra Kuenkel (Collective Leadership Institute) were keynote speakers of the 1st Eberswalde Ecosynomics Forum (April 2nd, 2015). Large system changes and collective efforts for a transformation towards sustainability were the overarching themes of the one-day event. The forum provided a collaborative space to explore possibilities for shared action, research and consultancy. Participants were invited guests from partner organisations and professional networks as well as students of the HNEE, International Master Study Programme Global Change Management and at the Europa-Universität Viadrina Frankfurt (Oder), Master of Public Policy. The programme of the forum is available here (PDF). 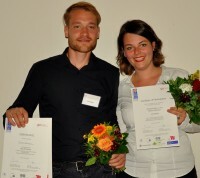 Lin Bautze and Simon Gerlinger won 2nd price in the competition „Between lecture hall and project work“ of the German Society for International Cooperation (GIZ). On Friday, 11th July 2014, the 13th final symposium of the GIZ´s university-level initiative “Between Lecture Hall and Project Work” took place at the Humboldt University in Berlin. The initiative fosters exchange of knowledge between professionals in the field of development cooperation and university students. This year, 4 teams of the Master Programme “Global Change Management” have been among the 12 finalists. Of these, the students Lin Bautze and Simon Gerlinger have convinced the jury with their outstanding presentation about land reform in Namibia. The movie entitled "Protection and Sustainable Use of the Selva Maya" is available in English, German and Spanish language. It was directed and produced by the 3rd semester GCM student Mr Nils Reinecke.The Selva Maya Programme is dedicated to the protection and sustainable use of over 5 million hectares of tropical rain forests located in Belize, Guatemala and southern Mexico. It is being executed by the German Cooperation (GIZ), commissioned by the German Federal Ministry for Economic Cooperation and Development (BMZ) in conjunction with the Central American Commission on Environment and Development (CCAD, in Spanish) and national counterpart organizations. This 20-minute film shows the main challenges for the Selva Maya and strategies proposed by the Selva Maya Programme to face them. Watch it here! In August 2013, five students of the International Master Study Programme Global Change Management had the opportunity to participate in a study tour across Brazil. While travelling the country for almost four weeks the students got a profound and exceptional insight into forest management practices in different Brazilian biomass, such as the Mata Atlantica, the Pantanal and the Amazon forest. One of the participants, Nils Reinecke, video documented the tour and interviewed several experts and scientists as well as rubber tappers, sawyers and environmental activists. The documentary is now online and can be seen here. We welcome all newly registered GCM-students to our special programme from September 23th - 27th. Get all the information about studying at the HNEE, about your study programme and study organization. The programme is available here . The movie entitled "Protection and Sustainable Use of the Selva Maya" is available in English, German and Spanish language. It was directed and produced by the 3rd semester GCM student Mr Nils Reinecke. The Selva Maya Programme is dedicated to the protection and sustainable use of over 5 million hectares of tropical rain forests located in Belize, Guatemala and southern Mexico. It is being executed by the German Cooperation (GIZ), commissioned by the German Federal Ministry for Economic Cooperation and Development (BMZ) in conjunction with the Central American Commission on Environment and Development (CCAD, in Spanish) and national counterpart organizations. This 20-minute film shows the main challenges for the Selva Maya and strategies proposed by the Selva Maya Programme to face them. Professor Spathelf and Mrs. Partzsch (2nd Sem. GCM) informed on Saturday, 16th of May on a conference of youth of "Bündnis90 / Die Grünen" about the course of studies 'Global Change Management' by the HNE Eberswalde. The interest in study contents of the master programme was very large. Following the meeting a detailed interview was given to the printmedium "Berliner Zeitung" regarding to contents of the course of studies and to the perspectives of climate protection. Eric Fee from Wisconsin (USA) received on September 26, 2008 the price of the DAAD (“Deutschen Akademischen Austauschdienstes”) for foreign students. The price endowed with 1000,- Euro was given for the outstanding achievements in his studies as well as his social engagement. Eric Fee was for many years the chairman of the association HORIZONTE. He was also engaged in the project „Geographie Live“, which took place in the schools of Eberswalde. On July 10th and 11th 2008, 135 scientists, politicians, representatives of the economy and user from seven European countries met in Berlin for the presentation of the final results of the BMBF-funded cooperative research project DENDROM. Not only the question if the forests of Brandenburg can sustainably supply sufficient wood to satisfy both the material and energetic demand for wooden biomass was answered, but also all aspects of short rotation coppice (SRC) production on agricultural land as additional wood source were discussed. The recent kick-off event on “Science for the Carpathians (S4C) ­ Strategy Development and Networking Workshop" (27th - 28th May 2008, Krakow, Poland) set the first milestone for a new science network for Global Change research in the Carpathian mountains. The workshop aimed at defining the current status of Global Change research in the Carpathians at drafting a research agenda for topics relevant to the region and at establishing an active science network. The nationalities of the 72 participants showed that Carpathian research is not limited to the eight Carpathian countries, but attracts interest from research groups from many parts of the world. From April 17th until 18th, the congress “Forest in Climate Stress” has been hosted by the Universtity of Applied Sciences Eberswalde (UASE), the J. v. Thünen-Institute, the ministry of environment and the Landesforstanstalt Eberswalde. Background of the congress were the challenges on new strategies of managing forests that climate change brings up. Having been hosting the congress, the institutions of the Eberswalde Waldcampus have underlined their wish for a close collaboration in the field of climate change and to develop their image as a centre of competence. Result of the congress was the “Eberswalder Erklärung”, a catalogue with 11 demands for ensuring the various forest functions and for enabling of a sustainable management. For the second time this year an information meeting on the five master study programmes of the University of Applied Sciences Eberswalde (UASE) is going to take place on April 16th. The programme starts with a plenum at 4 p.m. in which an introduction is held by Prof. Dr. Uta Steinhardt and each of the master study programmes are presented in short. Subsequent to the plenum at about 5:10 p.m. a discussion in specific forums to each master study programme will take place. This will be a unique chance of gathering information from students as well as from study course administrators. Invited is everyone who is interested but especially students of UAES’s Bachelor programmes in all semesters.You can find the invitation here! Within the competition 'Germany - Land of Ideas' the international Master Study Programme 'Global Change Management' at the Faculty of Forest and Environment was awarded a prize for being an outstanding innovative and creative project. In a venue on February, 19th Mr. Mario Werner from Deutsche Bank handed over a certificate signed by the President of the Federal Republik of Germany, Horst Köhler, and a panel of the campaign. The major event within the award ceremony will be a symposium entitled 'Klimawandel - Reichen gute Ideen?' on April, 10th, 2008 in Eberswalde. Gerrit Hansen and Eric Fee, first semester students of Global Change Management, are winners of the GTZ-initiative „Between Lecture Hall and Project Work“. The competition, organized for the seventh time by GTZ, fosters transfer of knowledge between higher education and practical development work. More than 100 students from Universities and Applied Universities analyzed 63 GTZ-projects. The winning presentation was entitled “Renewable energy for rural development in Afghanistan- vulnerability and adaptation to global change processes”. Invitation/Einladung: Festkolloquium "Globalen Wandel durch Bildung Gestalten"
The ceremonial colloquium with Dr. Hartmut Ihne (ZEFConsult / Centre for Development Research) takes place to honour the International Master's Programme Global Change Management as UNESCO Decade Project "Education for Sustainable Development". The event starts on February 18th at 3p.m. in the new lecture hall building (Waldcampus, Alfred-Möller-Straße 1). Find the programme herer. The city of Eberswalde has been rewarded with three prices in the competition “Germany — Land of Ideas”. The International Master Study Programme “Globbal Change Management” of the University of Applied Sciences Eberswalde (UASE) received one of these prices. The price emphasizes the unique international and future oriented idea of the Master Study Course. On April 10th, 2008, an interntional symposium “Sustainability and Climate Change - Educating Change Agents” is going to take place at the UASE (the programme will be announced in due time). Appreciating its dedicated activities in the field of education for sustainable development the UNESCO elected the study programme “Global Change Management” of HNEE-Eberswalde as an “UN-decade project”. The decade, standing under the protectorate of Federal President Horst Köhler, aims for establishing the thought of an ecologically, economically and socially sustainable development of world-society within all parts of the system of education. The award took place as part of the “Day of the Decade” on November 27th in Stuttgart. Within the programme “study and research for sustainability” the German Academic Exchange Service (DAAD) grants financial aid to notably academically qualified graduates, doctorates and post-doctorates. The programme is conceived to allow graduates, doctorates and post-doctorates from selected foreign countries as well as from Germany to study and research in Germany and abroad. Its main topics are sustainable use of biogenous resources and improvement of value added chains. Applications by graduates, doctorates and post-doctorates from Brazil, Russia, India, China, South Africa, Mongolia and Germany are welcome. until Nov. 15th. 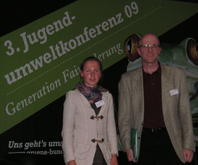 On June 5th, 2007 the Faculty of Forest and Environment of HNEE-Eberswalde started the initiative “Realeaf” in cooperation with PrimaKlima-weltweit e.V. and 3D-Spezialist Force Sunrise. “Realeaf” targets for promoting a CO2-neutral life in the online world of “Second Life”. In the faculty’s project “Second Life” user compensate their virtual identity’s (their avartar’s) energy consumption and the CO2-emission resulting from it through “real” reforestation projects in “real” rainforests in Congo, Madagascar and Ecuador.